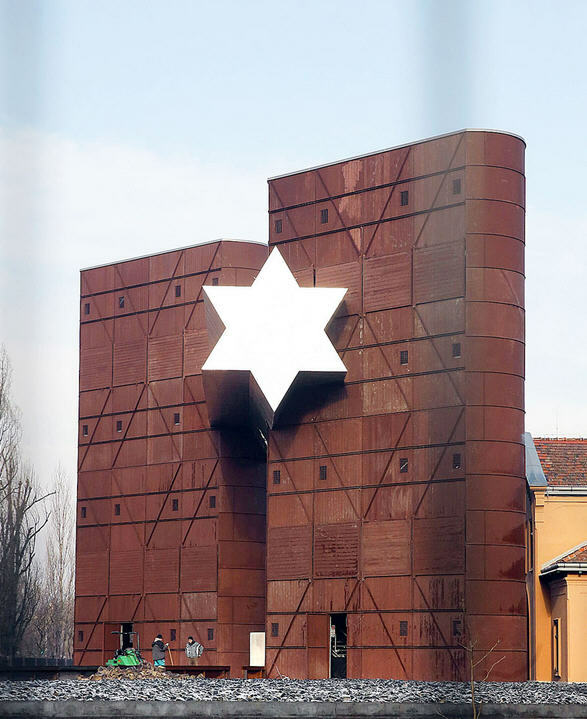 Last summer I wrote at least five posts about Mária Schmidt, a historian of the Holocaust and director of the controversial House of Terror museum established during the first Orbán administration (1998-2002). Why is Mária Schmidt so important? Why is it necessary to spend time on a historian not held in high esteem by her colleagues? It is true that as a historian she would not deserve much attention, but as the chief adviser to Orbán Viktor on matters of modern Hungarian history her ideas cannot be ignored. I don’t think I exaggerate when I claim that Schmidt’s interpretation of German-Hungarian relations in the 1930s and the first half of the 1940s is crucial to understanding the Hungarian government’s reevaluation of the Hungarian Holocaust. The newly erected memorial to “all the victims” of the German occupation of Hungary on March 19, 1944 was a direct result of Mária Schmidt’s views on the period. The other reason that I give her so much space is that every time she opens her mouth, or puts pen to paper, she says something outlandish. She begins radio and television interviews with syrupy sweetness and ends with shrill diatribes. She has been lying low on Holocaust issues since last summer, most likely because it looks as if János Lázár, Viktor Orbán’s deputy, decided to remove her from the job of spearheading the creation of a new Holocaust museum, the House of Fates. The government realized that no compromise could be reached between the administration and the Jewish community as long as Schmidt was in charge of the project. She refocused her attention on more recent events. Last month she wrote an essay on “geopolitical games” between Russia and the United States in which she didn’t spare the U.S. This was not a topic that excited too many people in Hungary. But then came an exchange of letters between Schmidt and the office of the German chancellor that she made public on February 4. Since the publication of this exchange she has given two interviews, one to György Bolgár on Klubrádió and another to András Kovács of Origo. I have the feeling that even if Angela Merkel hadn’t had such a tight schedule she wouldn’t have wanted to be associated with the reception Mária Schmidt organized. The Germans ever since 1989 have repeatedly said how grateful they were to the Hungarian government at the time, and here is an event that belittles the role of the Németh government and Foreign Minister Gyula Horn, whom the Germans revere. And that government, whether Schmidt likes it or not, was the last government of the Kádár regime. By that time the dictatorship had mellowed to such an extent that it was not a brave, heroic act to help the East German refugees. Thousands and thousands of ordinary citizens lent a helping hand alongside the Hungarian government. Schmidt’s invitation was something of a trap, which I assume the Germans noticed and wanted to avoid. Well, Schmidt was furious. She called Angela Merkel “the heartless chancellor.” She accused the Germans of never thanking these “brave civilians,” of thanking only the Hungarian government that existed “during the still functioning communist dictatorship.” Not only did Merkel not go but no “official representative” of Germany made an appearance when Schmidt gave memorial plaques to the few people she found worthy of the honor. And then came the interview with Origo. She accused Merkel of “insolence,” which ought to “shock all well-meaning Germans.” According to Schmidt, “the chancellor obviously did not know what country she was visiting.” Otherwise, surely she would have wanted to meet ordinary citizens. She also found Merkel’s words about democracy, freedom of the press, and civic groups puzzling. In her opinion, Merkel talked like a “left-liberal” instead of a Christian Democrat. Schmidt had a few not so kind words for the United States as well. According to her, M. André Goodfriend, the chargé d’affaires until the arrival of the new U.S. Ambassador Colleen Bell, “misunderstood his role and became enamored with his media appearances.” Everything has changed since the arrival of the ambassador, a claim that is most likely based on Colleen Bell’s frequent appearances at markets or social events, which of course may not indicate a policy change. According to Schmidt, Hungary is a true ally of the United States and “it would be very sad if there were people in Washington who would like to disrupt that bond.” She is certain that Hungary would like to restore good relations between the two countries, but “we must not forget that the Hungarian nation is a proud one that does not like it if an American diplomat comes here and tells us how we should or should not remember our past,” a not too subtle reference to the memorial that on Viktor Orbán’s insistence was erected despite international protest, a memorial that falsifies the history of the Hungarian Holocaust. Otherwise, at the moment Schmidt is organizing a conference, “Test of Bravery” (Bátorságpróba). The odd title seems to be lifted from a well-known picture book for children suffering from cancer. The conference will focus on the second Orbán government’s accomplishments between 2010 and 2014. I don’t know whether we can call it a drama, but that the Hungarian government’s already tarnished reputation now has an ugly rusty spot as well, that’s for sure. AFP picked up the news about the gigantic German investments that were agreed on during the meeting between the German chancellor and the Hungarian prime minister, but unlike András Kósa, the author of the Vs.hu article, AFP, before publishing the article, did go to the “spokesman for the Hungarian government [who] declined to comment.” Not did the spokesman not deny the story, as Válasz would have suggested, but he purposely spread the disinformation. That leaves me to believe that this PR stunt was concocted by the large communication team around the prime minister’s office. What can one say about a government that engages in such cheap tricks? Keep in mind that the team around Viktor Orbán was handpicked by the prime minister himself. The members of this team are the ones who manage “communication,” which seems to be the most important aspect of politics for Viktor Orbán. He is like a salesman who has only one goal: to sell his wares regardless of their value or even utility. What were these communication wizards thinking? Surely they had to realize that sooner or later reporters will ask these companies about their alleged plans and the truth will be revealed. Indeed, Mercedes and BMW have already denied the leaked information about their plans to build factories in Hungary, and this morning we learned from the Siemens spokesman that Siemens is no longer active in industries connected to nuclear energy and therefore the news about their involvement with the Paks Nuclear Power Plant is untrue. As far as the helicopters are concerned, apparently no decision has been made. It is possible that after the meeting Airbus, the French-German company reported to have won the contract, might not be the favorite. I can only hope that the story of this ruse will reach Angela Merkel’s office, not that I have any doubt about her assessment of the Hungarian prime minister’s character. In any case, the Orbán government’s courting of Germany as a counterbalance to the United States did not work out to Orbán’s satisfaction. Of course, he himself is partly to blame for the fiasco with his public defense of “illiberal democracy.” Even Gábor G. Fodor, a right-wing “strategic director” of Századvég, a Fidesz think tank, said that Viktor Orbán made a mistake when he openly defended his vision of “illiberal democracy.” In fact, he went so far as to say that “this debate cannot be won,” especially not before a western audience. If this absolutely devoted Orbán fan considers the prime minister’s defense of his ideology to have been a mistake, then, believe me, the mistake was a big one. So, here we are. After all the effort the government put into good relations with Germany, it looks as if Angela Merkel was not convinced. So, where to go from here? 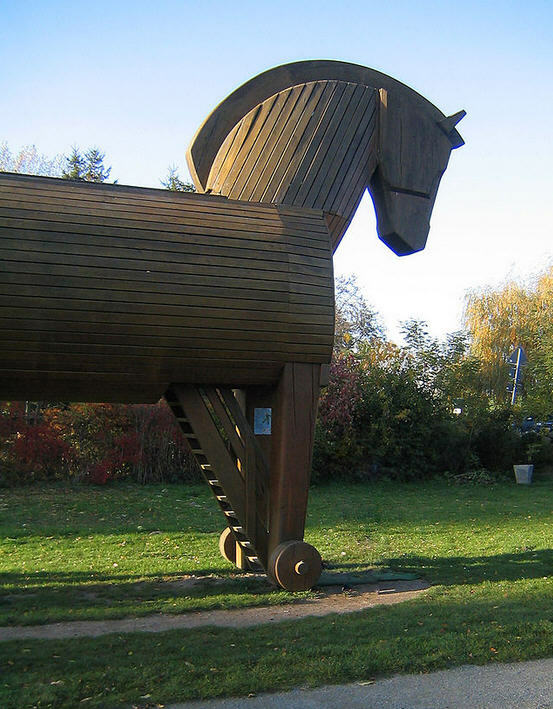 There seems to be a serious attempt at improving U.S.-Hungarian relations. This effort was prompted by the long-awaited arrival of the new U.S. ambassador, Colleen Bell, who shortly after her arrival began a round of visits and attended to a number of official duties. Her first trip was to Csaba Hende, minister of defense, which was reported by Hungary Today, a newly launched, thinly disguised government propaganda internet site. The news of her visit was coupled with the announcement of Hungary’s plans to purchase a new helicopter fleet. The fleet will consist of 30 helicopters that will cost 551 million euros. Discussing the helicopters and Colleen Bell’s visit in the same article was no coincidence. Most likely, the Hungarian government wants to give the impression that there is a possibility that the helicopters will be purchased from the United States. Bell, for her part, appealed to Hungarian pride by reminding her hosts that, although Alcoa has existed for 125 years, “this is not very long in terms of Hungary’s 1000-year-old history, but for the United States, a 125-year period covers half of its existence.” Music to Hungarian ears. Of course, she also promised that in the future she will work hard to create new opportunities for both U.S. and Hungarian businesses and to further improve their cooperation. The mayor of Székesfehérvár, the city where the Alcoa factory is located, announced that the wheels of buses in the city will gradually be replaced with Alcoa products. I somehow doubt that courting the United States in this manner will make Washington forget about the anti-American rhetoric of pro-government papers or the incredible performance of the Orbán government in connection with the U.S. banning of Hungarian nationals because of corruption charges. Somehow I have the feeling that courting the United States without changing government policies will be just as unsuccessful as Orbán’s earlier efforts in Germany. And one final note. Today Orbán announced that the fate of cheaper utility costs depends on his successful negotiation with Vladimir Putin on the price of gas and oil to Hungary. If he is unsuccessful, the current low utility rates cannot be maintained. The message? The Hungarian people should support his Russia policy. If not, their utility bills will rise again. Let me add that the team that came up with the idea of reducing utility prices hit a gold mine. The Orbán government’s popularity in 2012 was even lower than it is now. Yet a year and a half later the popularity of the party and the government soared. For Orbán utility rates are terribly important, and therefore I suspect that he will do everything in his power to strike a deal with Putin. The question is at what price. Yesterday I sketched out a number of hypotheses about Angela Merkel’s objective in visiting Budapest. Almost all Hungarian foreign policy experts were certain that Merkel would not touch on Hungarian domestic issues. Her only concerns would be Viktor Orbán’s compliance with the common EU policy regarding Russia and his treatment of German businesses in Hungary. Since the Hungarian prime minister accommodated on both fronts just prior to her visit, she would have little to complain about. The consensus was that she would remain silent on the state of democracy in Hungary. I, on the other hand, couldn’t imagine that Merkel could ignore this issue. The German press has been full of stories about Orbán’s authoritarian regime. It has given extensive coverage to Hungary’s anti-government, pro-democracy demonstrations. So there was some homegrown pressure on the German chancellor to stick her neck out and talk openly about the issue. Many people comment on Merkel’s low-key, sometimes vapid style. Those who know her better, however, assure us that in private she can be a tiger. Well, today, we caught a glimpse of that side of her character. This morning Gregor Peter Schmitz in Der Spiegel demanded “plain talk” from Merkel in Budapest. “The whole of Europe is terrified of extremists, Angela Merkel is meeting one,” he said. It is time to speak out. If Schmitz watched the press conference after a short luncheon meeting between Angela Merkel and the Hungarian prime minister, he was most likely disappointed, at least initially. She did talk about issues that democrats at home and abroad find important: the role of civil society and the importance of the opposition, but her critique was pretty bland. She said, for instance, that “even if you have a broad majority, as the Hungarian prime minister does, it’s very important in a democracy to appreciate the role of the opposition, civil society, and the media.” Merkel had said the same thing many times before. The real surprise, “the plain talk” Schmitz demanded, came at the end when Stephan Löweinstein of the Frankfurter Allgemeine Zeitung asked Merkel her opinion about Orbán’s “illiberal democracy.” After explaining that liberalism is part and parcel of the ideology of her own party, she added: “I personally don’t know what to do with the term.” In her opinion there is no such animal. Orbán did not back down. He repeated his belief that not all democracies are liberal and that liberalism cannot have a privileged position in the political landscape. I should add that the Hungarian state television station omitted this exchange in its broadcast of the press conference. Viktor Orbán was not a happy man. I’m certain that he expected concessions from Merkel after he was so “generous” on the RTL Klub case. 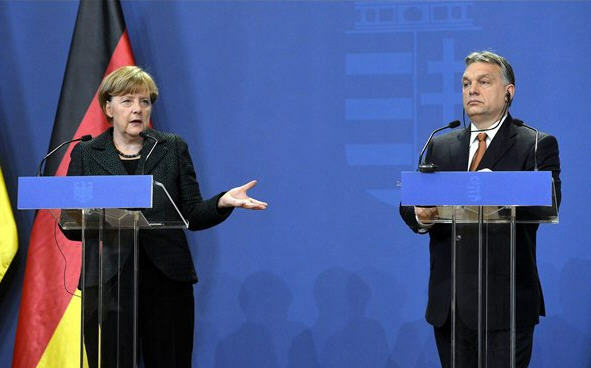 It seems that Merkel did not appreciate his efforts to the extent hoped for in Budapest. During the press conference Orbán talked mostly about German-Hungarian economic relations and thanked Germany for its investment, which resulted in 300,000 jobs in Hungary. But he became more insistent and strident as time went on, especially when Merkel began talking about a common European energy policy. He indicated that in his opinion the European Union doesn’t appreciate Hungary’s utter dependence on Russian gas. He stressed, in a raised voice, that the Russian-Hungarian long-term gas supply contract will be expiring soon and that Hungary must have a new agreement with the Russians. Hence the forthcoming Putin-Orbán meeting in Budapest. An opposition politician called my attention to the fact that Merkel referred to Orbán as “ein Kollege” instead of the customary designation “friend.” An American acquaintance noted that the new American ambassador also talks about Hungary as an “ally” and no longer as a friend. The German papers are already full of articles about the trip, and I’m sure that in the next few days there will be dozens of articles and op/ed pieces analyzing Merkel’s day in Budapest. 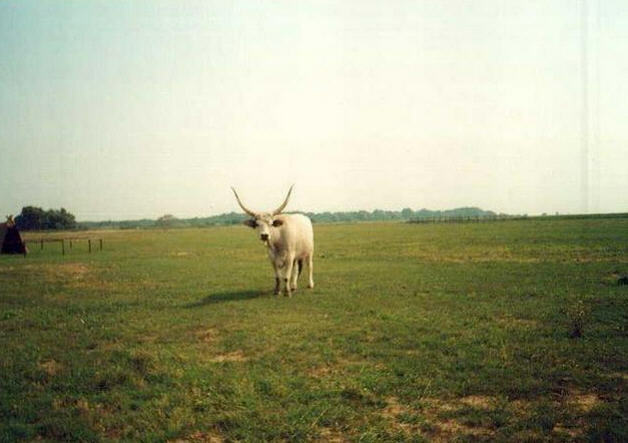 I’m also certain that I will spend more than one post on this visit. Here are a few initial observations. Merkel spent very little time with Viktor Orbán. Just a little over an hour, including a meal. With János Áder no more than 15-20 minutes. On the other hand, the event at the German-language Andrássy University was quite long where differences of opinion between the two politicians became evident. The introductory remarks by the president of Andrássy University were lengthy as was the speech by the president of the University of Szeged, which bestowed an honorary degree on Angela Merkel. Her own speech was not short either. What was most surprising was the number of questions allowed. Some of the questions were not political but personal. Perhaps the students didn’t have the guts to ask politically risky questions. Her answers showed her to be quite an open person, very different from what I expected. One brave soul did bring up the topic of terrorism and immigration, indicating that Orbán inflames prejudice against people from different cultural backgrounds. Merkel stood by her guns, stressing the need for tolerance, openness, and diversity. Another question was about Russian aggression. Here she used strong words against aggression and condemned Putin’s use of force. Finally, a few words about Merkel’s final destination, the synagogue on Dohány utca, where she talked to Hungarian Jewish religious leaders. Apparently, the Hungarians first suggested that Viktor Orbán accompany Merkel. The Germans turned that kind offer down. I find it significant that Merkel’s visit to the synagogue was longer than planned. Her plane left Budapest half an hour later than scheduled. 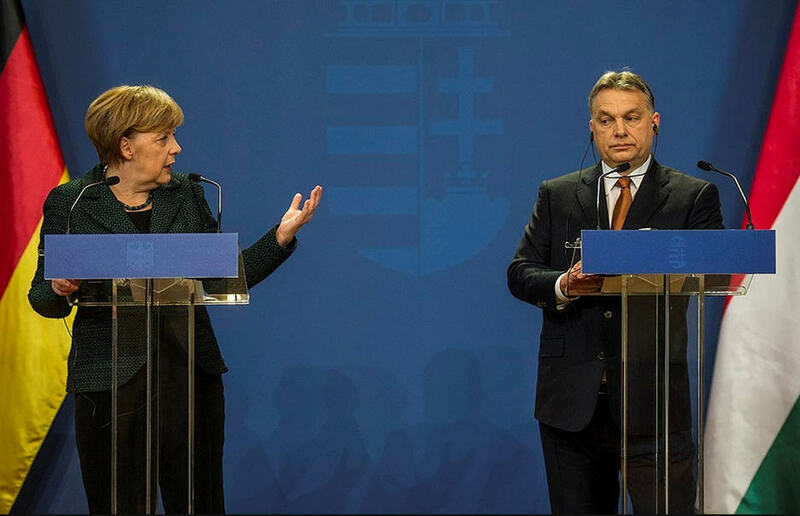 All in all, those people who were afraid that by going to Budapest Angela Merkel would give her stamp of approval to Viktor Orbán’s “illiberal democracy” can breathe a sigh of relief. Nothing of the sort happened. Posted in Hungarian politics and tagged Angela Merkel, Budapest, German, German-Hungarian relations, Hungary, illiberal democracy, Russia, Viktor Orbán, Vladimir Putin on February 2, 2015 by Eva S. Balogh. I am impelled to write to you on the occasion of your impending visit to Prime Minister Viktor Orbán of Hungary in February. I have no doubt that your able staff is more than adequately preparing your visit; however, I wish to add to that a point of view representing the Hungarian perspective. Surely, you are aware that the government of PM Orbán and his Fidesz Party have relentlessly attacked and emasculated most institutions of the democratic state ever since their election in May 2010. But, just to keep up appearances, they have maintained them as a façade, populating them with their own appointees, often for nine and twelve-year terms, thus rendering them unable and unwilling to carry out their original, constitutional functions, since the appointees only follow Fidesz instructions. From the outside they look like checks and balances to the unsuspecting viewer. However, nothing could be further from the facts. All those institutions are interconnected through the invisible network of personal and party connections, all serving to promote the political and financial interests of a selected few of Viktor Orbán’s friends. In fact, those institutions are only there to serve as a disguise, hiding the actual operations of a government whose single and concentrated aim is to siphon as much of the country’s resources to the hands of this small coterie, as possible. The street demonstrations of recent days mobilizing tens of thousands of people almost every other day, demanding democracy and fair government, are largely concerned with the ever-increasing corruption of the government. Those thousands are in dire need of help that could surely come from you Madame Chancellor. This monumental, institutional corruption is seemingly unassailable by the people, because Parliament, as the Prime Minister’s voting machine, legislates and legalizes the constant, obvious thievery. And as it so often happens, if a superficially constructed piece of legislation should prove insufficient to cover up the crime, either a subsequent retroactive law will bend the rules after the fact, or all complaints will be rejected or ignored by the Prosecutor’s Office. Since the election in 2010, not one single corruption case was launched against any corrupt government official, despite the numerous cases submitted. It is not surprising; therefore, if many consider the government of Viktor Orbán as a well-functioning Mafia operation. 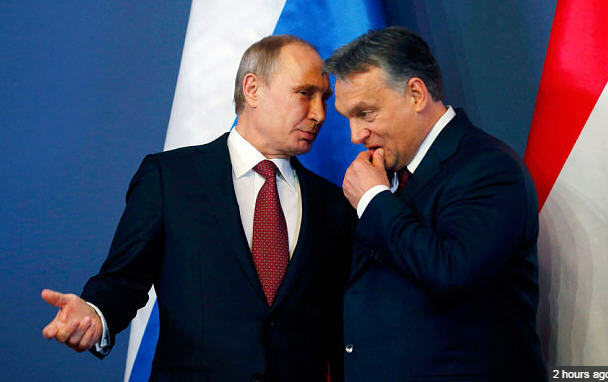 The presently concluded contract with Vladimir Putin’s Russia for the building and financing of the Paks 2 nuclear power plant is hugely disadvantageous to Hungary and yet a most rational pact in view of the rapacious corruption system. The contract includes a 20% Hungarian share in the financing – 2.5 billion Euros – that is available for stealing. Since the Hungarian state otherwise has run out of sources for available money to steal, this gigantic project will provide a copious source of corruption money for the coterie. At the same time, it may bankrupt the country, but by the time that will become clear, this Mafia will be long gone. Under these circumstances, even the government of the United States raised a strenuous complaint and took the unprecedented step of banning certain government officials from its territory for reasons of corruption. At the same time, the United States government made it clear that it will not shirk from the confrontation, and insists that the Hungarian government must address the systemic corruption. So far, Viktor Orbán has resorted to lies, denial, and communications trickery, but taken no action. Apart from some prestige projects, such as football stadiums and municipal beautifications, public investments ground to a halt years ago. Private capital is fleeing the country. If there is any investment at all in Hungary today, it is funded by European Union transfer money. In fact, over 90% of all public investment projects are financed by the European Union. But invariably, those projects are “one-off” short term ones that create neither lasting effect, nor permanent jobs for people. In fact, all that European Union financing is squandered on useless, short-term veneer, merely creating appearances and an opportunity for kickbacks. Presently, any government public bidding process is tailor-made for the single, Orbán-friendly bidder, and the general consensus is that the “usual” kickback is between 20 and 40%. Despite all this, the Orbán government is conducting an unrelenting verbal and political campaign against the European Union, the United States and most of all the ideals of liberal democracy. When the European Parliament commissioned the Tavares Report, it was assumed in good faith that the problems of the Orbán Government were mere mistakes and with the help of the Report itself, with some good advice, and genteel prodding, the system could be corrected. Today it is clear that the Orbán government is by no means acting in good faith. In fact, the Tavares Report failed to recognize that Hungary is rapidly and intentionally sliding towards a one-party, single-ruler, authoritarian, illiberal regime. The Report was to no avail; the Hungarian government not only ignored it, but also legislated its rejection. All this was done in front of the uncaring eyes of the European Union. While the officials and friends of the Orbán government are getting obviously and obscenely rich, the population of the country is sliding into deep poverty. Today, four million people are living under the poverty level, hundreds of thousands are starving and tens of thousands of children cannot get enough to eat. Poverty today is endemic in Hungary and it is increasing. Over the last four years, 500,000 of the mobile, enterprising people of Hungary have emigrated to other countries in the European Union, Germany amongst them. Not wanting to extend needlessly the list of reasons for writing this letter, I wish to come to the obvious implications. Hungary today is a disturbing foreign object in the very middle of the European Union. But because its transformation, running counter to everything European, is far from complete, it is likely that in the future she will be a cause for much more, and much more painful headaches within the European Union. The process of transformation is accelerating unbridled, and Hungary will be a source of an unhealthy inspiration, inviting any self-appointed tin-pot dictator to repeat the exercise: build an illiberal, single-ruler dictatorship and do it at the expense of the European Union. Why not? Nobody is raising any objections and the money keeps flowing to finance the process. The interest of the European Union, the people of Hungary, and basic common sense dictate to submit to you the humble request that you, a dominant person in the European Union and in the World, give an unmistakable expression of disapproval to Mr. Orbán about what is happening in Hungary. It is inconceivable, and yet a strange fact of life, that the European Union and its citizenry should generously finance Hungary’s corruption, its war against Western Values and Mr. Orbán’s campaign against the people of his own country. Why should the European Union pour billions of Euros into a few people’s pockets, just to enable them to steal even more? The suspension or denial of the transfer payments would bring the insane policies of the Orbán government to a screeching halt since nothing but these payments keeps it going. The European Union, on the other hand, would greatly benefit from saving those billions by using them for more worthy purposes than stuffing the pockets of a corrupt regime that uses them as an opportunity to conduct a surreptitious anti-European, anti-liberal, people-busting war in peace time. I fervently hope that my suggestions coincide with your own intentions, and that your highly anticipated visit to Hungary will bring the beneficial results most of us are hoping for. It would be a bitter disappointment for the entire country if Prime Minister Orbán could in any way interpret your visit as a public relations success and a stamp of approval on his policies. Sándor Kerekes is a freelance journalist whose articles regularly appear in Kanadai Magyar Hírlap. He also wrote several articles in the past for Hungarian Spectrum.